Testing of the Orion Service Module Umbilical (OSMU) is complete at the Launch Equipment Test Facility at NASA’s Kennedy Space Center in Florida. 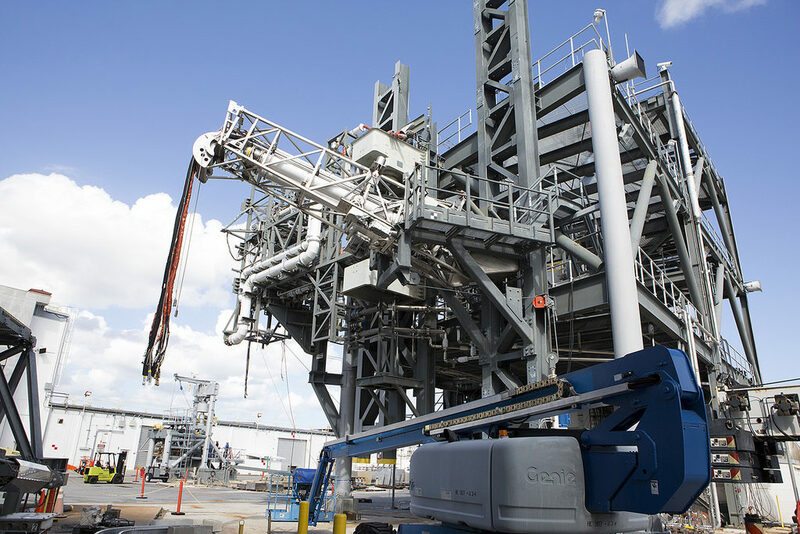 A series of tests, called regressions tests, were performed on the umbilical’s design modifications to validate it for installation on the mobile launcher. The tests were conducted by Kennedy’s Engineering Directorate for the Ground Systems Development and Operations Program. During the tests, the OSMU was connected to the facility’s Vehicle Motion Simulator 1 and the umbilical’s release mechanism that will connect to the service module was tested to confirm it is functioning properly. The OSMU will connect from the mobile launcher tower to the Orion service module at about the 280-foot level of the mobile launcher tower. Prior to launch, the umbilical will transfer liquid coolant for the electronics and air for the environmental control system to the Orion service module that houses these critical systems to support the spacecraft. The OSMU also will provide purge air and gaseous nitrogen for environmental control to the Launch Abort System located atop the spacecraft. The OSMU will release and tilt back, away from the service module, before launch. NASA’s Space Launch System (SLS) will launch with the Orion spacecraft atop for its first flight in 2018. The SLS is the rocket that will carry Orion to deep space destinations, including the agency’s Journey to Mars.